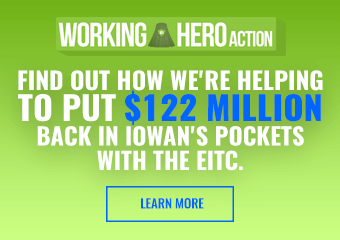 Governor Kim Reynolds has the first fully negative TV ad out in the Iowa governor’s race. 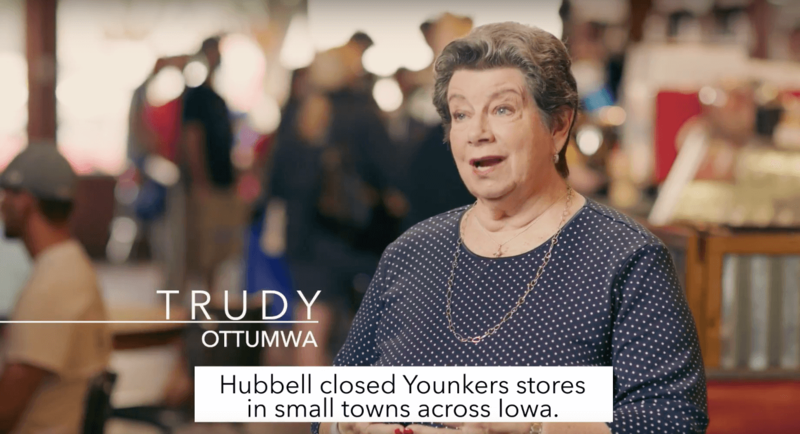 In it, local Iowans from Newton, Spencer and Ottumwa criticize Fred Hubbell for the closures of Younkers department stores in their towns about 30 years ago. Trudy of Ottumwa is Trudy Caviness, the Republican Party chair of Wapello County. She also used to serve on the Republican Party of Iowa’s state central committee. Kevin of Spencer is Kevin Brown, the Republican Party co-chair of Clay County. Tara of Spencer appears to be his wife. Diane of Newton looks to be Diane Birchard, who appears to be a recent former head of the Republican Party in Jasper County, or at least a top activist with some sort of title there. 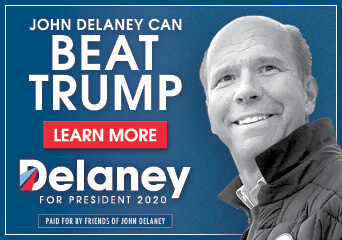 Now, it’s obviously not completely unheard of for campaigns to use party activists in their ads, even as they’re posing as seemingly-neutral Iowans who are upset at a politician. But the choice of these people is telling about Reynolds’ campaign and whether these Younkers closings from three decades ago actually resonate with local voters in these communities. 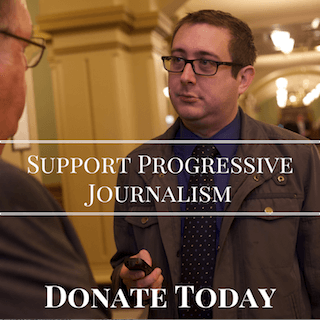 Reynolds’ campaign has had months to prepare their negative attacks on Hubbell. Even with the Democratic primary, there were plenty of signs that Hubbell was going to be victorious (and you prepare for everyone regardless). And given all the messaging they’ve already done on the Younkers closures (from billboards to this TV ad to their “Fired By Fred” website), it’s clear they think this is one of their best lines of attack. So, with all of that lead time to get their first negative ad ready, they still couldn’t find a single person who wasn’t a Republican Party leader that was actually impacted by the local Younkers shutting down 30 years ago? Kevin Brown and his wife are in their 20s and 30s. Given their graduation dates from high school, Tara was likely one or two years old when the Younkers in Spencer closed in 1990. Kevin was likely four or five. And they both grew up one county over in O’Brien County, anyway. It’s very easy for a campaign to just skim through the county party leadership lists to recruit a couple local Iowans for ads. Maybe viewers won’t notice any difference, but certainly it would be a more effective ad if you found someone who was actually laid off all those years ago. To do that, however, your campaign has to have extensive, natural contacts throughout the state that go deeper than just party leadership. This seems to suggest that the Reynolds campaign, which has had significant staff turnover, may not have that. It also indicates that perhaps these closures weren’t quite as impactful as Reynolds is spinning them to be if there aren’t people coming out of the woodwork to talk about their experience. Hubbell’s campaign has other issues with the ads. “Unsurprisingly, without a positive record or vision to run on and a lackluster general election start, the extremely vulnerable Kim Reynolds has to resort to cherry picking and grossly distorting facts against Fred Hubbell from over 30 years ago,” said communications director Remi Yamamoto in a press release. The Hubbell campaign points out that Younkers actually vastly expanded their workforce during Hubbell’s leadership, growing it from 3,000 to 4,100 positions from 1986 to 1989. They also noted that he allowed for extra overtime and days off for workers, created Farm Aid scholarships for students during the Farm Crisis and that the store had high customer satisfaction overall. They also explain that Reynolds’ timeline is simply wrong and knock down the accusation that Hubbell gave himself a $90,000 raise. What they say actually happened was that Hubbell got a promotion to become president of Equitable of Iowa, which was Younkers’ parent company at the time. Others have pointed out that many department store chains shut down their stores in similar-sized towns during the late 1980s and early 1990s. Overall, it’s an interesting – and rather sloppy – start to Reynolds’ full-fledged negative messaging against Hubbell on the Iowa airwaves. I remember the Younkers employees from 30 years ago. A good many of them appeared to be past retirement age back then, so they may be hard pressed to get an interview with some of them. Was it his fault the one in Waterloo closed too??? Laughable and lies. All the damage done in Iowa is very visible and very sad.